Canada-wide shipping available. Contact us for details. Ideally, when purchasing a rug, it should be seen in person, spread out on the floor. Always go to a reputable shop that you can trust. Online shopping is convenient but when it comes to rugs there are many benefits to buying your rug in person. You will be able to assess the colours more accurately in person. Remember that most rugs will have a light and dark end, depending on the direction of the pile. If you’re interested in a rug, make sure to view it from both ends. It is also important to touch and feel a rug. There are various materials, pile densities and finishes which can affect the feel of a rug. When purchasing a rug in person, you can touch, feel and compare the various qualities. Oftentimes, the rug can be taken to your home for approval. Most reputable shops will offer this service and can bring a few of your favourite options to be seen in your home. 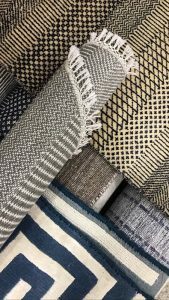 Nowadays, there are many qualities available at more affordable prices, and the consumer should know their options prior to settling on a machine-made rug. If you’re considering a machine-made rug, keep in mind that it should cost next to nothing, as there is no labour required in their production and the fibers are basically poor quality plastic. Wool is the most common and best material for making rugs. A hand-knotted wool rug will outlast a machine-made rug by at least 50 years on average. Learn more about rug quality here. First and foremost, do you like the rug? Is it attractive? Normally, the right rug will stand out to you. Will it harmonize (size, design, colour) with its intended setting? Is it within your intended budget? 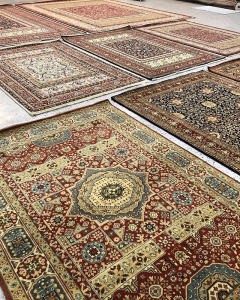 Since 1992, Kasra Persian Rugs has carried one of the largest inventories of hand-knotted Persian and Oriental rugs in the Greater Toronto Area. We also have a growing collection of contemporary rugs as well as a full custom rug service. Click here to view examples of our inventory. Welcome to Kasra Persian Rugs, proud importer of genuine handmade Persian and Oriental rugs in Toronto. Visit our showroom in Richmond Hill to experience the collection first hand, or click through our online Rug Gallery featuring many of our hand-made pieces.